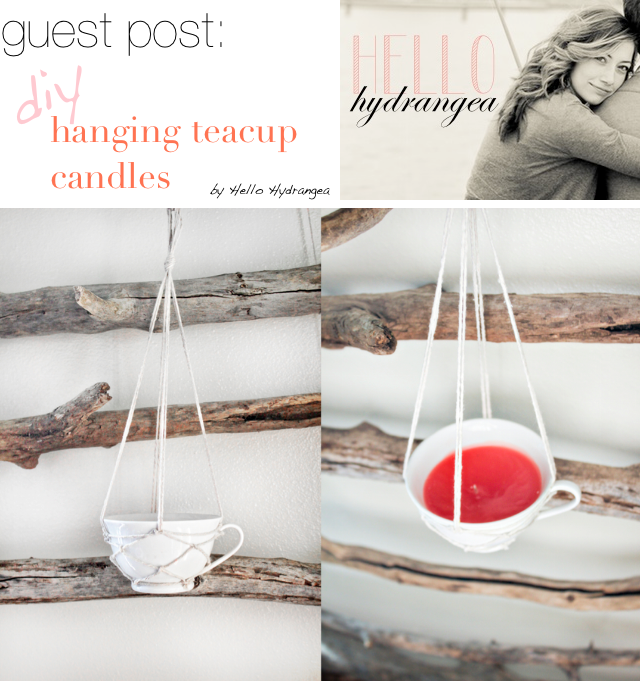 Guest Post from Lindsey of Hello Hydrangea! About a year ago I introduced you to a new blog I'd found called Hello Hydrangea. Lindsey is an incredible artist with beautiful projects that just boggle my mind. Part of what fascinates me about her blog is the types of projects she does. 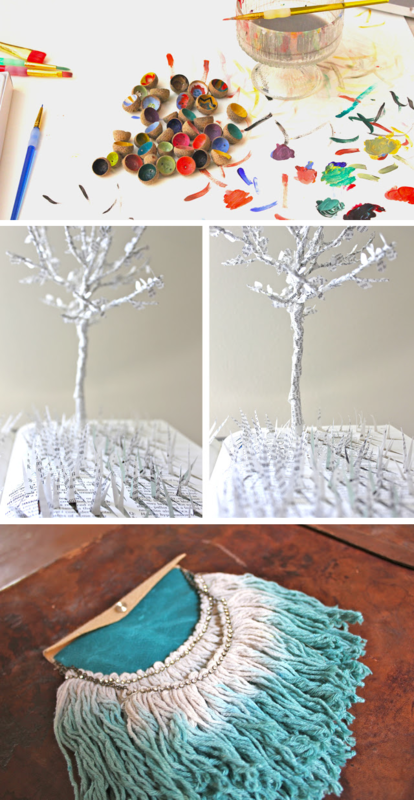 Such interesting materials and mediums, definitely not the average cookie-cutter sewing crafts blog. I love. Check out this artistic eye candy from her blog. Nom. Today she's sharing a project that I really loved! I can't wait to try it in my kitchen. Over at Hellohydrangea.com you learn about my childhood life on my family’s apple orchard farm in Washington State. Growing up, my family would sometimes move our entire dining room table and chairs outside, below our favorite tree and eat under the stars. Although warm summer nights are disappearing, we still spend as much time as possible outside, so when the temperature rises even a bit, we are ready to have a moonlit party! 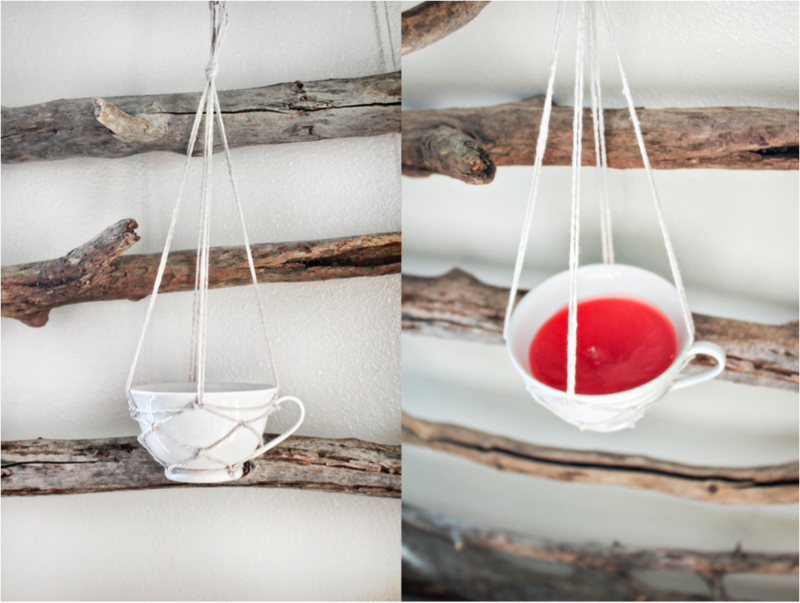 I can just imagine; if had a dozen of these hanging teacup candles a few years ago, we would have hung them in the tree above us and dined by candlelight. The materials for this project includes 3 items: old candle wax, thrifted teacup and some string. I found the teacup for $.50 at our local thrift store and the ‘Scentsy’ wax was $1.00 for a box. 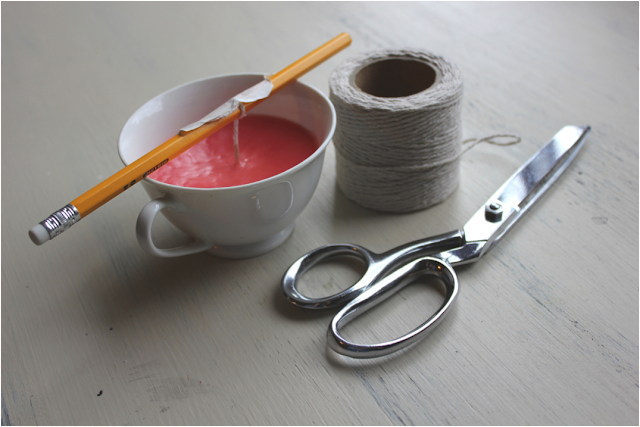 The first step is to create a wick for your new candle. Using cotton twine, tape the bottom to the cup and the top to a pencil to keep it standing up straight. Then you need to chop up the wax into small chunks and warm it in a clean tin can over the stove. 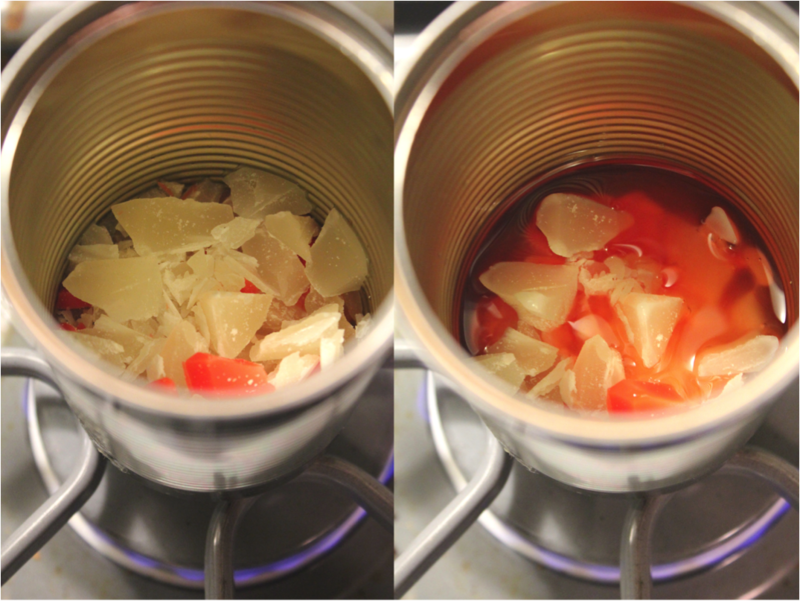 It should only take about three minutes for the wax to melt – once its liquid, all you have to do is pour it into the teacup and wait for it to solidify. If you prefer to leave your teacups gravity-bound, the project ends here. However, if you want to hang your new candles for ultimate excitement, follow the next few steps. 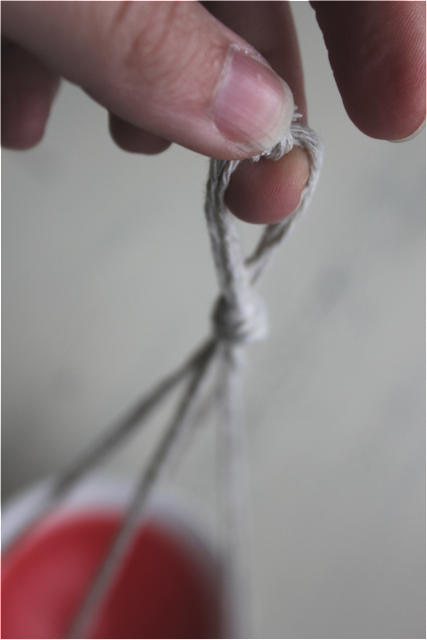 Cut four 4ft lengths of string and knot them onto a single 10in piece at their middle so that you have 8 even, long strings hanging off of the 10in piece. 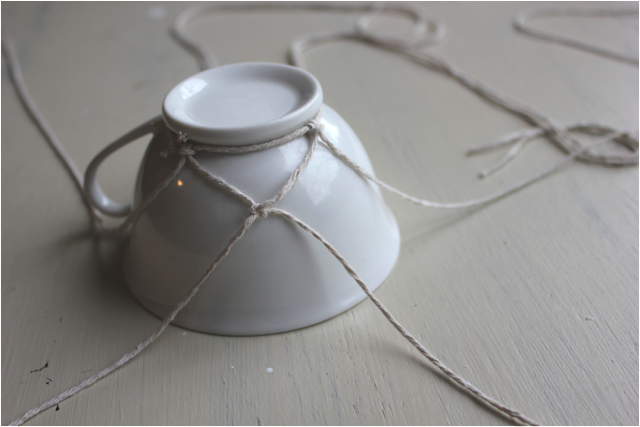 Lay your teacup upside down and knot the 6in length of string tightly onto the base. 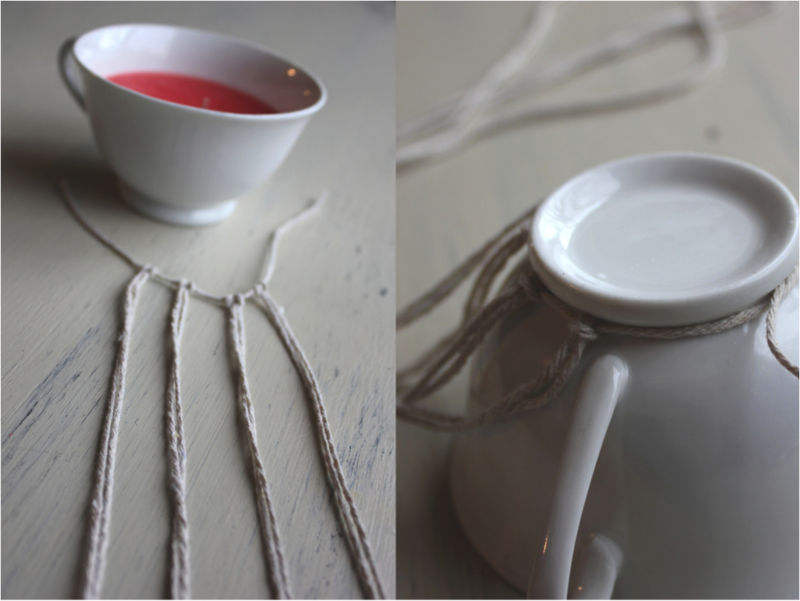 Spread the 4ft lengths evenly around the circumference of the cup. 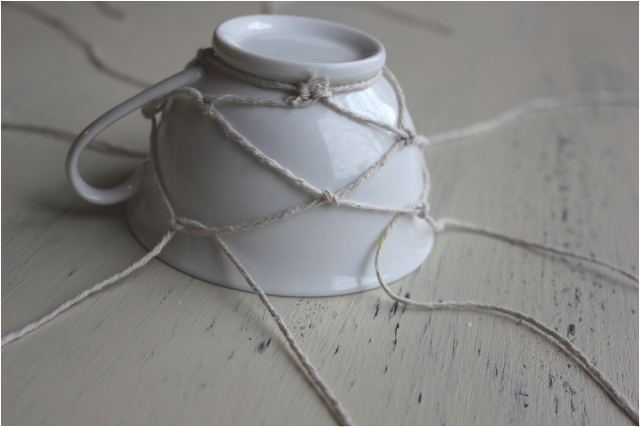 While the teacup is still upside down beginning basket knotting the 8 long pieces of string in an alternating pattern. Continuing doing this tightly enough that the weaving knots hug the shape of the teacup. Now all you have to do is knot the leftover string at your desired length and hang them up where your little heart desires. An added bonus? 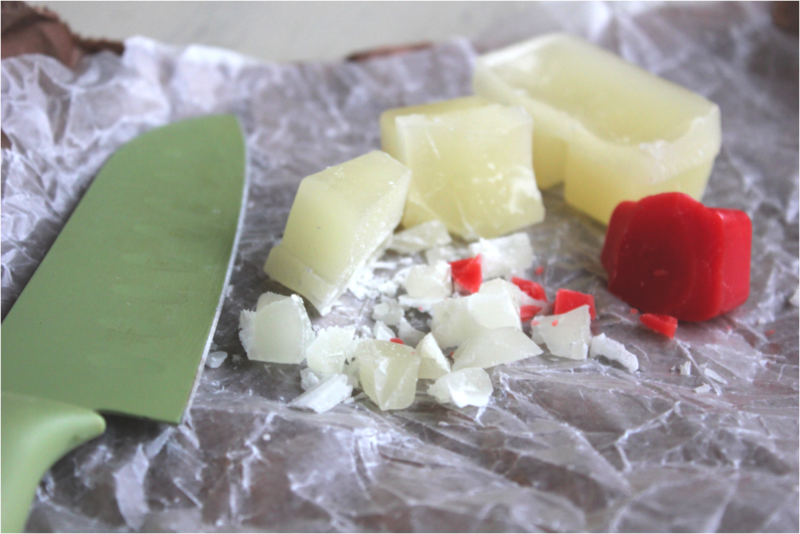 If you use scented wax you will end up with a couple aromatic, glowing decorations for your next dinner party, romantic date or even a wedding reception. I'm thinking that this spring I might try to grow my herbs in tea cups like this too, and hang from the kitchen window. How fun would that be? Lindsey, thank you so much for sharing your project and beautiful photos. I love your style so much. 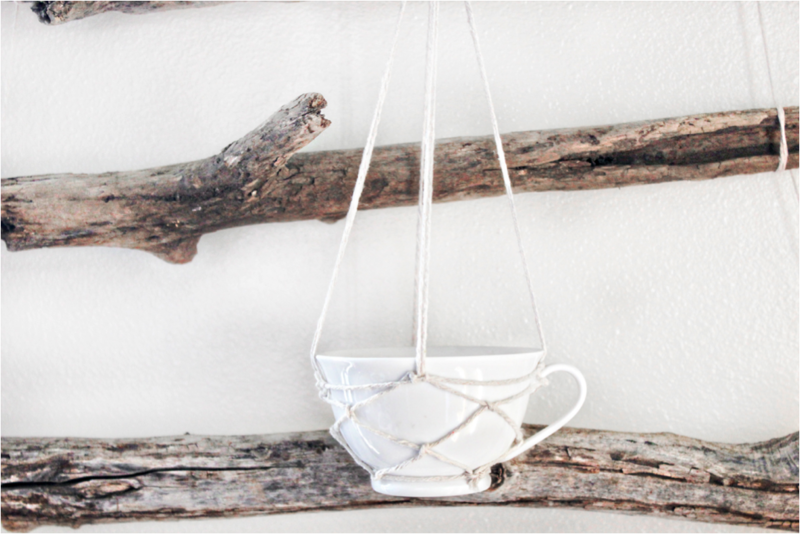 This is so cute, but at the end I started wondering if the heat from the flame would eventually cause a fire hazard to the cotton strings above...what do you think? I think what Lindsey said is right-it doesn't look like the flame would be in any contact with the string. However, be sure that your wick is trimmed to 1/4'' length, and as always, of course, never leave a candle burning too long or unsupervised. Thankyou Disney! I totally agree with the Target problem haha. 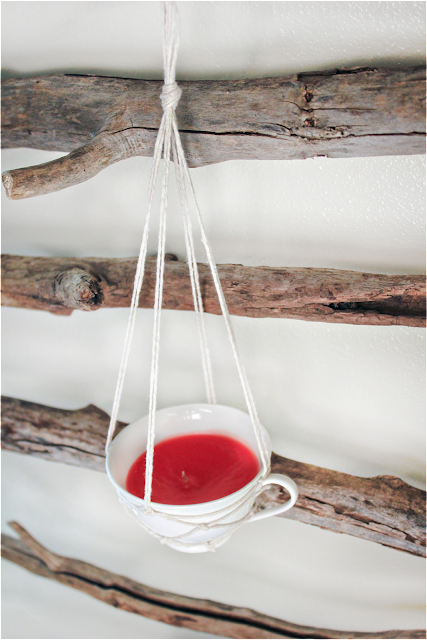 Amanda - I have been using this lately and the teacup brim is wide enough that the flame never gets near those strings! Really nice original and artistic. I think to grow herbs in it and hang it can be also so cool. I love this. I want to hang a million of them and hide my treats in them.